By far one of the most famous and respected brands in the vape industry is of course Vampire Vape. Heisenberg is legendary and of course award winning, Pinkman is a fan favourite across the globe. We are proud to now hold their Nicotine Salt E-Liquid range available both wholesale and retail from Official Aspire. Fully TPD compliant, awesome and smooth in a 10ml Bottle. 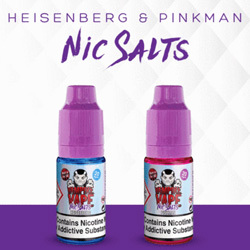 Pinkman Nicotine Salt - Vampire Vapes The devine fruit flavour of the vampire vape original P..